Using children as political props did not start with Ganduje. However, he is now on record as the first to use children to justify corruption. It is not only sinful, it is criminal! Here we are in a country populated by wicked and unfeeling leaders, for whom stealing and material acquisition is a pathology. By law, children should be protected from all forms of exploitation, given their age, inexperience and vulnerabilities. Children should not be used for political ends. Only parents have the right to determine how their children interact with the world, except in extraordinary circumstances. Even then, parents should not exploit the innocence of their own children. Were it not for our individual and collective loss of shame, the taking of bribe as captured in the Ganduje video is enough reason for him to resign with contrition. Instead of taking responsibility for his actions, Ganduje doubled down, became belligerent and questioned the authenticity of the video. There is something disturbing, even sinister, about the placard campaign orchestrated by Ganduje and his minions. It is worse that the children of the poor, apparently recruited from Madrasahs, were unfairly targeted for the placard show of shame. By using children as emotional props to cover up corruption and play politics, the Kano State governor has lowered the bar far beyond what was previously thought possible. Ganduje’s display of muscular criminality is a disgrace on many levels. What a drivel! Using children as political props did not start with Ganduje. However, he is now on record as the first to use children to justify corruption. It is not only sinful, it is criminal! Here we are in a country populated by wicked and unfeeling leaders, for whom stealing and material acquisition is a pathology. Here we are in a country where citizens do not understand the civics of active citizenship, nor do they appreciate the responsibilities of followership as prerequisites for good governance. Ganduje encouraged using the young and vulnerable to take a position on a sensitive legal/political issue without notice to their parents, and certainly without their express consent. Even if the all the parents of these poor children are uneducated, not all of them will give express permission for their children to be used as a cover for a crime. The Ganduje types are inculcating a see-no-wrong culture in children at ages where those children do not have the mental capacity to even come close to understanding the depth of the major issues going on around them. This is a pretty sick behaviour and a sad one as well. It should be a concern to all of us, while being roundly condemned. It is unacceptable that for selfish reasons, for individual agenda and sometimes for parochial group interests, children are getting socialised into the criminal school of thought where nothing is sacred. Where is honour? Where is shame? Where is probity? Public schools across Nigeria are increasingly using kids for political advocacy. Whether it is lining them up in the blazing sun to wave at passing dignitaries, who would not spare them a wave back or taking them to a rally to hold up signs. It is plainly wrong! Children should never be used as political props with or without their parents’ consent. Do children watch the news? Do they know who is stealing what? Do they know why their parents throats are being slit in the North-East? Do they have the faintest idea that their childhood of deprivation is largely the fault of Ganduje types? It is beyond shameful that we are essentially programming children, who are far too young to understand anything of substance, to become legitimisers of irresponsibility. 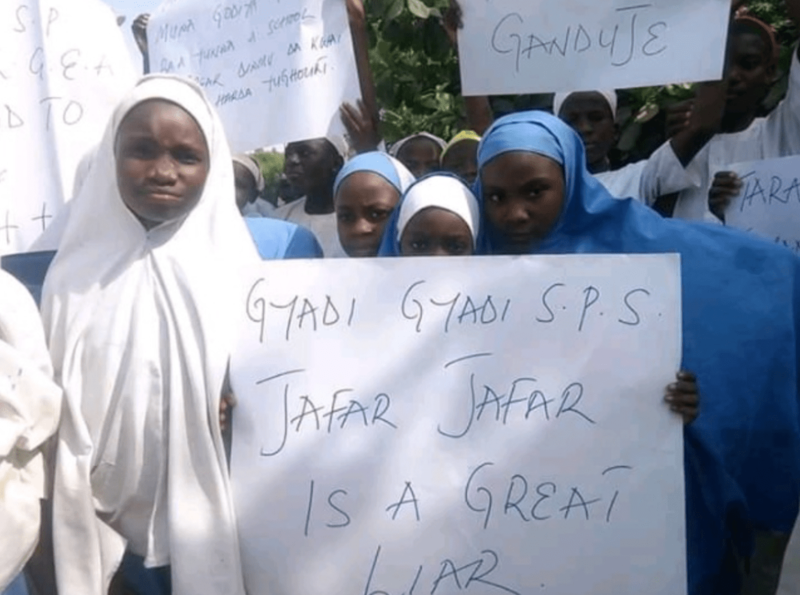 The Ganduje types are inculcating a see-no-wrong culture in children at ages where those children do not have the mental capacity to even come close to understanding the depth of the major issues going on around them. This is a pretty sick behaviour and a sad one as well. It should be a concern to all of us, while being roundly condemned. Our past is bad, our present is worse and we are trying to rob the future. Why? The use of children for politics, religion, to celebrate and endorse adult ambitions or criminal behaviour must be discouraged. Children are unable to process all the facts regarding social, economic and political issues, the history behind such issues and the reasons behind them. Parading children for political reasons is the lowest form of persuasion. And it needs to stop, now. Any politician who parades children, no matter his political party, should never be listened to. Such politician is not arguing the facts, but arguing emotions. Ganduje and his morally challenged supporters are trying to frame and spin his moral failure as a 2019 re-election issue for him and President Buhari. It is not. That is lame political rhetoric that is not addressing the issue at hand. It is tiresome. When a politician uses this type of argument, it is ultimately because s/he has nothing else to say; all his/her other arguments have been defeated by logic or it is just easier to invoke emotions. No amount of spin will make Ganduje’s argument stronger. Every silly defence he has put up bears no reliance on any sort of fact. It is all about emotions, and when emotions get infused into politics, politics becomes a dangerous endeavour. Ganduje’s dollar tripping and his slow motion absolution by the Kano State House of Assembly is the worst thing that could happen on the current political scene and is an affront to Buhari’s dying anti-corruption fight. The use of children for politics, religion, to celebrate and endorse adult ambitions or criminal behaviour must be discouraged. Children are unable to process all the facts regarding social, economic and political issues, the history behind such issues and the reasons behind them. It is hard enough for adults to process the insanity around us. The use of children for politics is bad enough, using them as accessories to crime is reprehensible. Children are already victims of our irresponsibility. Stop it!